PALERMO, Italy (AFP) -- Pope Francis visits the Italian island of Sicily on Saturday to pay homage to a priest murdered by the mafia 25 years ago after trying to save youngsters in poor neighbourhoods from falling into their hands. The Argentinian pontiff‘s visit will be brief but is part of a wider campaign he has been waging against organised crime. He is expected to arrive in Palermo at 10:45 am (0845 GMT) and will say mass, then head to the Palermo parish where Father Giuseppe “Pino” Puglisi lived. He returns to Rome in the early evening. Puglisi, known as “the first martyr of the Mafia”, was shot dead on September 15, 1993, his 56th birthday. He is said to have uttered his last words to his killer, “I’ve been waiting for you”, before dying on the doorstep of his modest home. His assassination came at a time when Italy was already traumatised by the killings of anti-Mafia judges Giovanni Falcone and Paolo Borsellino. For the previous two years Puglisi had been parish priest in the rough Palermo neighbourhood of Brancaccio, where he attempted to engage the local youth and keep them away from drugs and the mafia groups who supplied them. In 2012 Francis‘ predecessor Benedict XVI officially recognised Puglisi as a “martyr” who was “killed by hatred of the faith”. The following year he was beatified in the presence of 40 bishops and 750 priests as well as the Italian interior and justice ministers. Beatification is the first step on the path to Roman Catholic sainthood. Since becoming pope in 2013, Francis has openly confronted the mafia -- often benefactors and practising members of Catholic parishes -- and called on the faithful to stop all collaboration with them. The pontiff has already visited Naples and Calabria, other Cosa Nostra hotspots in Italy’s south. In 2015 in Naples, the notorious fiefdom of the country‘s oldest organised crime syndicate the Camorra, he condemned those “who exploit and corrupt young people, the poor and the disadvantaged”. In Calabria, he called on Catholics to combat the Calabrian mob, known as the ’Ndrangheta. 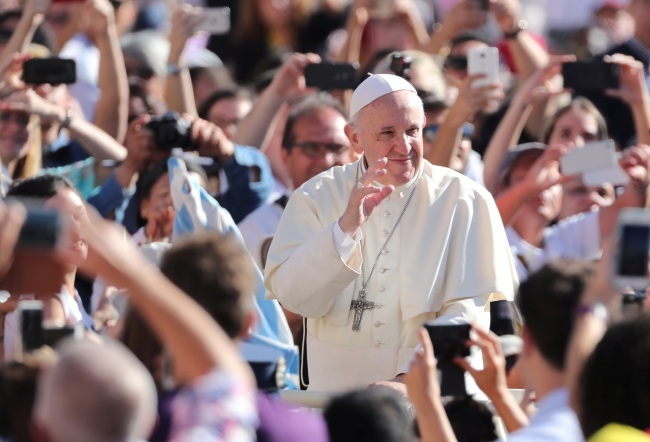 “Those who in their lives follow this path of evil, as the mafiosi do, are not in communion with God,” the pope said during his Calabria visit. “They are excommunicated” he declared to thunderous applause from the 100,000 people who came to hear him. Excommunication is the severest penalty for Catholics, banishing them from the spiritual life and sacraments of the church. Local bishops have already excommunicated mafia members but the Vatican is considering creating a new doctrine excommunicating organised crime group members worldwide. The pope has often denounced the “money stained with blood, which leads to an evil power” and called on mafiosi to “change your lives. Convert. Stop doing evil”. His comments hark back to an angry address by Pope John Paul II in the Sicilian town of Agrigente in 1993 when he called on mobsters to “convert yourselves!” and urged ordinary Sicilians to revolt against the mafia. The Sicilian Godfathers responded two months later with attacks against two Catholic churches. Despite the papal rhetoric, relations between the church and organised crime groups have often been ambiguous. The Vatican’s bank, the Institute of Religious Works (IOR), became notorious after the 1982 death of Roberto Calvi, known as “God‘s banker because of his links to the Vatican, whose corpse was discovered hanging from Blackfriars Bridge in London. Prosecutors believe it was a mafia killing linked to money laundering via the bank. There have also been attempts to bribe or otherwise influence priests and the misappropriation of resources from institutions and charities, and questions over the purchase of Vatican real estate in the past. In southern Italy religious processions sometimes stop outside the home of a local mafia boss. But some local bishops are taking a stand. Last year the bishop of Monreale, near Palermo, made headlines by criticising a priest who had allowed the son of one of Sicily’s most notorious mobsters, Toto Riina, to act as godfather at a baptism. In late 2016, a priest in southern Italy who had wanted to hold a mass in memory of a ‘Ndrangheta mafia boss murdered in Quebec was taken to task by the mayor, the archbishop and his parishioners.